Kiev, also known as Kyiv (Ukrainian: Київ ▶, Kyiv, IPA: [ˈkɪjiw]; Russian: Ки́ев ▶, Kiyev), the capital and the largest city of Ukraine, is located in the north central part of the country on the Dnieper River. Founded in the fifth or sixth century as a trading post, it acquired eminence in the tenth to twelfth centuries a capital of Kievan Rus', a medieval East Slavic state. Destroyed during the Mongol invasion in 1240, it was a provincial capital of marginal importance until the city prospered during the Russian industrial revolution in the late nineteenth century. From 1934, Kiev was the capital of the Ukrainian Soviet Socialist Republic. During World War II, the city suffered significant damage, but recovered, remaining the third largest city of the Soviet Union, to become, after independence in 1991, the capital of Ukraine. Kiev is an important industrial, scientific, educational and cultural center of Eastern Europe. UNESCO has recognized the "spiritual and intellectual influence of Kiev-Pechersk Lavra which contributed to the spread of Orthodox thought and the Orthodox faith in the Russian world from the seventeenth to the nineteenth century," and as such designated Kiev's religious buildings a World Heritage Site in 1990. 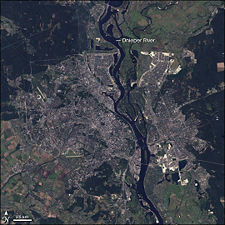 A Landsat 7 image of Kiev and the Dnieper River. The name Kiev is translated as belonging to Kyi, who was one of four legendary founders of the city, along with brothers Shchek and Khoryv, and sister Lybid. Kiev is the traditional and most commonly used English spelling of the name, but since the 1995 adoption of Kyiv by the Ukrainian government as a preferred spelling, the Ukrainianized version Kyiv is gaining usage. The city is located at an elevation of 587.3 feet (179 meters) on both sides of the Dnieper River, which flows south towards the Black Sea. The older right-bank (western) part of the city has numerous woody hills, ravines and small rivers, and is a part of the larger Dnieper Upland adjoining the western bank of the Dnieper. Kiev expanded to the Dnieper's lowland left bank (to the east) only in the twentieth century. Significant areas of the left-bank Dnieper valley were artificially sand-deposited, and are protected by dams. The Dnieper River forms a branching system of tributaries, isles, and harbors within the city limits. The mouth of the Desna River and the Kiev Reservoir are at the north of the city, and the Kaniv Reservoir at the south. Both the Dnieper and Desna rivers are navigable at Kiev, although limited by the reservoir shipping locks and the winter freeze-over. Kiev has a continental humid climate. The average maximum daytime temperature in January of 24.8°F (-4°C), rising to an average maximum of around 77°F (25°C) in July. Snow cover usually lies from mid-November to the end of March, with the frost-free period lasting 180 days on average, but surpassing 200 days in recent years. Average annual precipitation is 26.6 inches (677mm). Kiev covers an area of 300 square miles (780 square kilometers). Most of the Kiev's historical attractions, as well as most business and governmental institutions, are located on the right bank. In the twentieth century, the city expanded into the eastern left bank, which is predominantly residential. There are large industrial and green areas on both banks. 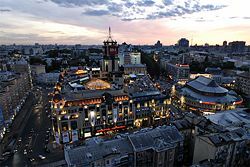 Kiev's downtown is a dotted contrast of new, modern buildings among the pale yellows, blues and grays of older apartments. The most expensive properties are located in the Pechersk, and Khreshchatyk areas, while it is prestigious to own a property in the newer Kharkivskyi neighborhood or Obolon Raion along the Dnieper. Ukrainian independence brought Western-style residential complexes, modern nightclubs, classy restaurants, and prestigious hotels. To attract tourists, buildings at the center of Kiev have been restored and redecorated, especially the Khreshchatyk street and Independence Square. Many historic areas of Kiev, such as Andriyivskyy Descent, have become popular street vendor locations, where one can find traditional Ukrainian art, religious items, books, game sets (most commonly chess) as well as jewelry for sale. Monument to legendary founders of Kiev. The Podol neighborhood of Kiev. 1890 postcard. Child victim of the Holodomor, 1933. 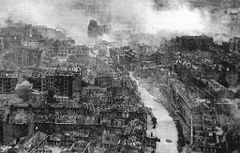 Ruins of Kiev, as seen during World War II. Soviet investigators, at left, inspecting an opened grave at Babi Yar, 1944. Orange-clad demonstrators gather in the Independence Square on November 22, 2004. The Parus Business Centre, one of the new office towers built throughout the city. The first settlements around Kiev date from 15,000 to 40,000 years ago, according to archaeological findings. Around 3000 B.C.E., tribes there practiced agriculture and animal husbandry, and traded with the nomadic steppe dwellers to the south, with Scythians, Sarmatians, and Khazars, and with the ancient Greek colonies on the Black Sea coast. 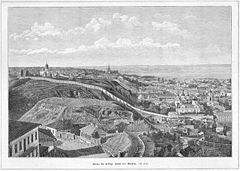 According to a twelfth century chronicle, each of three East Slav brothers, Kiy, Shchek, and Khoriv, established a settlement upon a hill, which grew to become Kiev. A small stream in the area was named after their sister Lybed. Lacking historical records for the founding dates of the city, it is believed that Kiev was probably founded in the fifth century. (There are no known historical records as to the founding dates of the city. Sources generally provide varying estimates of the fifth or sixth century C.E.) May 1982 was chosen to celebrate the city's 1500th anniversary. During the eighth and ninth centuries, Kiev was an outpost of the Khazar empire, and in the late ninth century Kiev was ruled by the Varangian nobility. About 882, the Novgorod ruler Oleg captured Kiev and made it the center of the first East Slavic state, Kievan Rus. The introduction of Christianity in 988 made Kiev the spiritual center of Rus, which thrived from the eleventh to the early twelfth century. It was reputed as one of the largest cities in the world at that time, with a population exceeding 100,000 people. The Cathedral of St. Sophia, parts of the Monastery of the Caves, and the ruins of the Golden Gate remain from the 400 churches built at that time. Troops of Andrei Bogolyubsky (1111–1174), a prince of Vladimir-Suzdal, sacked Kiev during a war in 1169. In 1240, the Mongol invasion of Rus led by Batu Khan (1205–1255) destroyed Kiev. In 1321, the greatly diminished city and surrounding area was conquered by Gediminas (1275–1341) for the Grand Duchy of Lithuania. Kiev was reduced to a fortress and minor market on the frontier between Lithuania and the Tatars of the steppe. Frequently attacked by Crimean Tatars, the city was destroyed in 1482 by Crimean Khan Meñli I Giray. 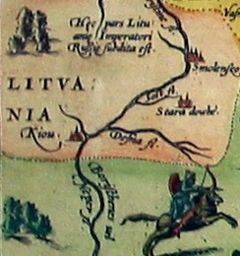 The 1569 Union of Lublin, between Lithuania and Poland, meant Kiev and the Ukrainian lands were controlled by the Polish-Lithuanian Commonwealth. Kiev became a center of Orthodox opposition to expanding of Polish Roman Catholic influence. Peter Mogila (1596–1646), an Eastern Orthodox theologian and metropolitan of Kiev from 1633 to 1646, founded what later became the Academy of Kiev. Cossack hetman Bohdan Khmelnytsky (1595—1657) and Crimean Tatars entered Kiev in 1648. The 1654 Pereyaslav Agreement submitted Ukraine to Moscow until 1667, when the Treaty of Andrusovo made Kiev and the Dnieper left-bank part of Ukraine an autonomous Cossack state protected by Moscow. Russian empress Catherine the Great (1729-1796) abolished Ukrainian autonomy in 1775. Under tsarist Russian rule, Kiev remained a center for Christian pilgrims, although until the 19th century the city's commercial importance remained marginal. Kiev prospered again during the late nineteenth century industrial revolution when it became the third most important city of the Russian Empire. After the 1917 Russian Revolution, Kiev became the capital of the independent Ukrainian People's Republic on November 7, 1917. Kiev changed hands 16 times from the end of 1918 to August 1920. The Russian revolutionary Bolsheviks took control of Kiev in 1918 and finally in 1920. After the Ukrainian SSR was formed in 1922, Kharkiv was declared its capital. The Soviet industrialization that began in the late 1920s turned Kiev, a former center of commerce and religion, into an industrial, technological and scientific center. One of the largest national catastrophes of the Ukrainian nation in modern history with direct loss of human life in the range of millions was the Ukrainian Famine, or Holodomor. While this was a part of a wider famine that also affected other regions of the USSR, the term Holodomor is specifically applied to the events that took place in territories populated by ethnic Ukrainians. In 1932-1933 over seven million Ukrainians, roughly one quarter of the population, perished in a famine that most modern scholars agree was caused by the policies of the government of the Soviet Union under Joseph Stalin implemented by Lazar Kaganovich, rather than by natural reasons. For this reason, the Holodomor is sometimes referred to as the Ukrainian Genocide, arguing that the Holodomor was engineered by the Soviets, with the intent to force collectivization and destroy any independent national consciousness. In 1934, the capital of Ukrainian SSR was moved to Kiev, and the city boomed again during the years of the Soviet industrialization. At that time, many old churches, such as St. Michael's Golden-Domed Cathedral and the Fountain of Samson, were demolished, while others, such as Saint Sophia Cathedral were confiscated. Continued migration changed the ethnic balance of the city from the previous Russian-Ukrainian parity to predominantly Ukrainian, although Russian remained the dominant language. In the 1930s, recurring political trials were organized in the city to purge "Ukrainian nationalists," "Western spies," and opponents of Soviet leader Joseph Stalin (1878–1953). In the late 1930s, thousands of Kievite intellectuals and party activists were arrested in the night, hurriedly court-martialed, shot and buried in mass graves. During World War II (1939-1945), Nazi Germany entered Kiev on September 19, 1941. Before the evacuation of all significant industrial enterprises, the Red Army planted more than 10,000 mines throughout the city, controlled by wireless detonators. On September 24, when the German invaders had settled in, the mines were detonated, destroying major buildings and setting the city ablaze for five days. More than a thousand Germans were killed in what was "the biggest and most sophisticated booby trap in history." During two days in September 1941, the Nazi Einsatzgruppen massacred at least 33,771 of Kiev's Jews at the Kiev suburb of Babi Yar, which was also a site of additional mass murders of up to 60,000 captured Soviet citizens over the following years, including Roma, POWs and anyone suspected in aiding the resistance movement). The Soviet Army liberated the city on November 6, 1943. For its role during the war, the city was later awarded the title Hero City. Post-wartime in Kiev was a period of rapid growth. The arms race of the Cold War caused the establishment of a powerful technological complex in the city, specializing in aerospace, microelectronics, and precision optics. Dozens of industrial companies were created employing highly skilled personnel. Dozens of research institutes formed the Academy of Sciences of the Ukrainian SSR. More than a dozen military schools and academies were established here, also specializing in high-tech warfare. A new wave of Russification took place in the 1970s, in which universities and research facilities were gradually and secretly discouraged from using the Ukrainian language. On April 26, 1986, the fourth reactor of the Chernobyl Nuclear Power Plant, located 100 km north of Kiev, exploded. However, the prevailing winds blew most radioactive debris away, although some areas of Kiev were polluted. Kievans were neither informed about the threat of the accident, nor recognized as its victims. On May 1, 1986, Communist Party leaders ordered Kievans (including hundreds of children) to take part in a parade in the city's center—"to prevent panic." Later, thousands of Chernobyl refugees were resettled in Kiev. After 57 years as the capital of the Ukrainian Soviet Socialist Republic of the Soviet Union, and in the wake of the 1985-1991 collapse of the Soviet Union, the Ukrainian independence was proclaimed on August 24, 1991. Kiev became the capital. The city was the site of mass protests over the 2004 Ukrainian presidential election by supporters of opposition candidate Viktor Yushchenko (b. 1954) beginning November 22, 2004, at Independence Square. Much smaller counter-protests in favor of Viktor Yanukovych (b. 1950) also took place. Ukraine is a republic in which the president, who is elected by popular vote for a five-year term, and is eligible for a second term, is the chief of state, and the prime minister is head of government. The unicameral Supreme Council, or Verkhovna Rada, has 450 seats allocated to members on a proportional basis to those parties that gain three percent or more of the national electoral vote. Members serve five-year terms. The Kiev municipality has a special legal status within Ukraine in that the city is subordinated directly to the national-level branches of the Government of Ukraine, skipping the regional level authorities of the Kiev Oblast. Additionally, the leading governmental position is held by the locally elected, rather than appointed, figure, and the municipal self-governance institutions have increased responsibility in local affairs. The popularly elected Kiev City Council is the city-level legislative body of Kiev. The Mayor of Kiev, who is independently elected by a separate election, chairs the council and is the head of the City State Administration. Administratively, the city is divided into 10 "raions" ("districts"), which have their own locally elected governments with jurisdiction over a limited scope of affairs. Kiev is further informally divided into neighborhoods, each housing from about 5000 to 100,000 inhabitants. A 2006-2007 power struggle between the president and the prime minister, aggravated by the fact that each represents opposite ends of the political spectrum and differ on foreign and internal policy, has hampered Ukraine's growth. The avenue to the Kiev's Railway Terminal. After Russia, the Ukrainian republic was the most important economic component of the former Soviet Union. Its fertile black soil generated more than one-fourth of Soviet agricultural output, and its farms provided substantial quantities of meat, milk, grain, and vegetables to other republics. Likewise, its diversified heavy industry supplied unique equipment (including large diameter pipes) and raw materials to industrial and mining sites (vertical drilling apparatus) in other regions of the former USSR. Per capita GDP was estimated at $7000 in 2007. Kiev, as the capital of Ukraine, is the location of government offices. Kiev has the headquarters for Antonov Aircraft Manufacturing company. Kiev Arsenal factory, founded in 1764 as a repair and production facility of the Russian army, is one of the oldest and most famous factories in the city. Other companies produce equipment for chemical works, such as conveyor lines for vulcanized rubber, linoleum, and fertilizer factories, as well as metal-cutting machines. Other engineering products include hydraulic elevators, electrical instruments, armatures, river-and-sea crafts, motorcycles, and cinematography equipment. Kiev's chemical industry produces resin products, fertilizers, plastics, and chemical fibers. Lumber milling and the production of bricks and reinforced concrete items are another well developed industry. Consumer manufactured goods include cameras, thermos flasks, knitwear, footwear, a range of foodstuffs, and hand watches. Kiev is also a large publishing center. Kiev has a developed railroad infrastructure including a long-distance passenger station, six cargo stations, depots, and repair facilities. Railways and all-weather roads link Kiev to Moscow, Kharkiv—which is Ukraine's second largest city—to the port of Odessa, to southern and western Ukraine, and to Poland. The Kiev River Port is located on the right bank of the Dnieper River in Podil, the historic and administrative district of the city. Boryspil Airport serves many international airlines, and the smaller Zhulyany Airport, serves mostly domestic flights and limited flights to nearby countries. Public transportation in Kiev includes the metro (underground), short-range trains known as elektrichkas, buses, trolleybuses, trams, taxis, and privately owned minibuses, or marshrutkas. The Kiev funicular climbs up the steep right bank of the Dnieper River and transports 10,000 to 15,000 passengers daily. The main entrance to the Kyiv Mohyla Academy. About 2.7 million people live in Kiev, according to 2007 municipal estimates. Ukrainians constitute the largest group of the 130 nationalities and ethnic groups residing within Kiev, accounting for 82.2 percent of the population. Russians comprise 13.1 percent, Jews 0.7 percent, Belarusians 0.6 percent, Poles 0.3 percent, Armenians 0.2 percent, Azerbaijanis 0.1 percent, Tatars 0.1 percent, Georgians 0.1 percent, and Moldovans 0.1 percent. Russian is the more widely used language despite the fact that Ukrainian is claimed as their native language by almost three times as many residents as those who claim Russian. According to a 2006 survey, Ukrainian is used at home by 23 percent of Kievans, as 52 percent use Russian and 24 percent switch between both. Regarding religious affiliation, 50.4 percent of Ukraine's population adhered to the Kiev Patriarchate of the Ukrainian Orthodox Church in 2006, 26.1 percent to the Moscow Patriarchate, 8 percent were Ukrainian Greek Catholic, 7.2 percent Ukrainian Autocephalous Orthodox, 2.2 percent Roman Catholic, 2.2 percent Protestant, 0.6 percent Jewish, while 3.2 percent were deemed as other. Kiev hosts nearly 200 institutions of higher education, notably the Kiev National Taras Shevchenko University, and the Kiev Polytechnic Institute. A center of Eastern Orthodox Christianity, Kiev's holy sites, of which the Monastery of the Caves and the Saint Sophia Cathedral are the most famous, attracted pilgrims for centuries and are recognized as a UNESCO World Heritage Site, and belong to the Seven Wonders of Ukraine collection. Kiev's numerous theaters include the Kiev Opera House, Ivan Franko National Academic Drama Theater, Lesya Ukrainka National Academic Theater of Russian Drama, the Kiev Puppet Theater, October Palace, and the National Philharmonic of Ukraine. There are the Dovzhenko Film Studios, and the Kiev Circus. Kiev is known as a green city with two botanical gardens, numerous parks, and trees everywhere. Museums include the Kiev State Historical Museum, the Museum of the Great Patriotic War, which features the giant Mother Motherland statue, the National Art Museum, the Museum of Western and Oriental Art, and the National Museum of Russian art. The historic Andriyivskyy Descent is the site of the Castle of Richard Lionheart, the baroque-style St. Andrew's Church, the home of Kiev-born writer Mikhail Bulgakov, and of the monument to Yaroslav the Wise, the Grand Prince of Kyiv. On Independence Square in the city center, two tall columns elevate monuments of the city protectors—the Archangel Michael, and the goddess-protector Berehynia. Football is the most popular spectator sport in Kiev, followed by basketball and ice hockey. Football clubs include Arsenal Kyiv and Dynamo Kyiv. During the 1980 Summer Olympics held in the Soviet Union, Kiev held the preliminary matches and the quarter-finals of the football tournament at its Olympic Stadium, which is the largest Ukrainian stadium and can accommodate 83,053 spectators. Kiev's long history, its status as the center of the Ukrainian Orthodox Church, and as a World Heritage Site, plus its importance as an industrial, scientific, and educational center, mean the city is well placed to benefit from Ukraine's economic growth. Although the nation achieved independence in 1991, democracy remained elusive as continuing state control and endemic corruption stalled efforts at economic reform, privatization, and civil liberties. Although the economy was predicted to expand, the government's plans to reinstate tax, trade, and customs privileges, and to maintain restrictive grain export quotas endanger long-term growth. St. Michael's Golden-Domed Cathedral, 1998 reconstruction. Holy Dormition Cathedral of the Kiev Pechersk Lavra, post-1991 reconstruction. Golden Gate (Zoloti Vorota), 1982 reconstruction. Verkhovna Rada building, the Ukrainian parliament. ↑ Modris Eksteins, Walking Since Daybreak: A Story of Eastern Europe, World War II, and the Heart of our Century (Boston: Houghton Mifflin Co., 2000, ISBN 061808231X), 87. ↑ U.S. Commission on the Ukraine Famine, Report to Congress, April 19, 1988, Findings of the Commission on the Ukraine Famine. Retrieved January 19, 2009. ↑ Robert E. Conot, Justice at Nuremberg (New York: Harper & Row, 1983, ISBN 9780060151171), 225. ↑ According to the official 2001 census data ,  approximately 75 percent of Kiev's population responded 'Ukrainian' to the native language (ridna mova) census question, and roughly 25 percent responded 'Russian'. On the other hand, when the question 'What language do you use in everyday life?' was asked in the 2003 sociological survey, the Kievans' answers were distributed as follows: 'mostly Russian': 52 percent, 'both Russian and Ukrainian in equal measure': 32 percent, 'mostly Ukrainian': 14 percent, 'exclusively Ukrainian': 4.3 percent. Welcome to Ukraine. What language is spoken in Ukraine? Retrieved December 29, 2008. ↑ Zerkalo Nedeli. March 12, 2006. "Kiev: the city, its residents, problems of today, wishes for tomorrow," in Russian, in Ukrainian. Retrieved December 29, 2008. Ascher, Abraham. 2002. Russia: A Short History. Oxford: Oneworld. ISBN 9781851682423. Burgess, Tom. 2008. Kiev. Cityspots. Peterborough: Thomas Cook. ISBN 9781841579061. Magocsi, Paul R. 1996. A History of Ukraine. Seattle: University of Washington Press. ISBN 0295975806. Paxton, John. 1993. Encyclopedia of Russian History: From the Christianization of Kiev to the Break-up of the U.S.S.R. Santa Barbara, CA: ABC-CLIO. ISBN 9780874366907. World Factbook. 2008. Ukraine. Retrieved December 16, 2008. This page was last modified on 17 April 2018, at 14:23.